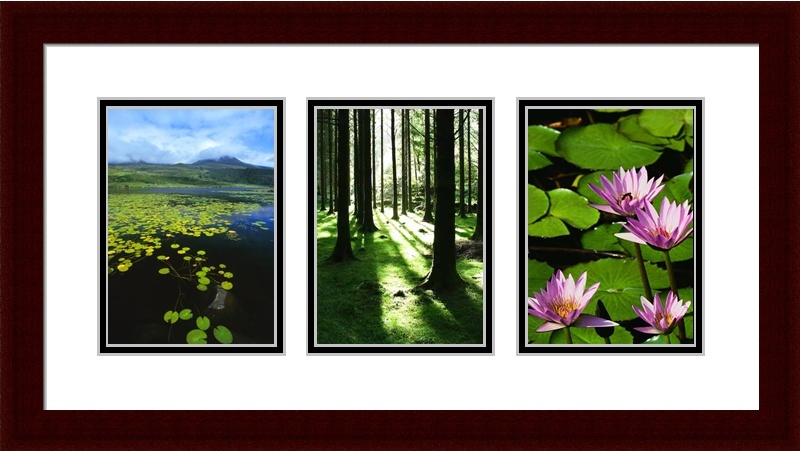 Upload your photos to be printed and framed in any of the multi aperture layouts below. To start, just select a layout. You will then be able to Upload and Cropyour photos. Once you have uploaded your photos, you can change the colour of the mount or change to a double mount and select a frame from over 100 frame designs. Each frame is individually hand-crafted. Upload your photos to be printed and framed in any of the multi aperture layouts below. To start, just select a layout. You will then be able to Upload and Crop your photos. Once you have uploaded your photos, you can change the colour of the mount or change to a double mount and select a frame from over 100 frame designs. Each frame is individually hand-crafted. What if You Don't See the Layout You Require?. First, check if any of the options available would be suitable if you rotated your photos BEFORE loading. For instance, you may want to have a landscape vertically above another landscape. You can see the design but it is for portraits. In this case, all you do is rotate your landscapes by 90 degrees and then load them. This will work out fine as the frames hang either way. There is a very large collection to choose from but if you don't see the layout you require, just email your design to us at sales@photoframes.ie. You can use Microsoft Word Shapes or Microsoft Outlook Shapes to set our your design. Or alternatively, just call us on 09064-77346. Each layout has a 4cm or 5cm border all round and 3cm in between each photo but if you want different borders and seperations, just ask. The prices quoted below includes printing and mounting your photos on 260gsm Fuji premium photographic paper using UV inks If you want a custom multi photo frame but you want to get your own prints done, you can order the frame and mount alone from our custom multi photo frame section. 2 photos – size 8"x12"
3 photos size 8" x 10"
3 photos size 8" x 12"
3 photos size 10" x 12"
4 photos size 4" x 6"
4 photos size 5" x 7"
4 photos size 6" x 8"
4 photos size 8" x 10"
4 photos size 8" x 12"
6 photos size 4" x 6"
6 photos size 5" x 7"
6 photos size 6" x 8"
9 photos size 4" x 6"
9 photos size 5" x 7"
9 photos size 6" x 8"
3 photos size 6" x 4"
3 photos size 7" x 5"
3 photos size 8" x 6"
3 photos size 10" x 8"
3 photos size 9" x 6"
2 photos size 6" x 4"
2 photos size 7" x 5"
2 photos size 8" x 6"
2 photos size 9" x 6"
2 photos size 10" x 8"
2 photos size 12" x 8"
2 photos size 12" x 10"
3 photos size 4" x 6"
3 photos size 5" x 7"
3 photos size 6" x 8"
3 photos size 6" x 9"